Can a virtual infrastructure help gain control over increasing data? Any organization experiencing fast growth is bound to see challenges in the scalability and stability of their virtualized infrastructure. 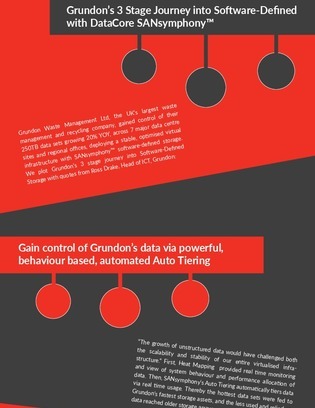 Grundon Waste Management Ltd. certainly did, and they were able to gain control of their data by deploying a stable and optimized virtual infrastructure. Read this case study to see the steps Grundon took to correctly implement this infrastructure, and why they chose SANsymphony as their virtual infrastructure partner.